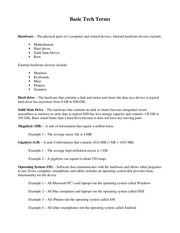 This PDF 1.5 document has been generated by Microsoft® Word 2010, and has been sent on pdf-archive.com on 28/06/2011 at 07:14, from IP address 118.96.x.x. The current document download page has been viewed 1061 times. File size: 192 KB (5 pages). A monitor - Looks like a television screen. Temporary storage of information (known as data in more technical terms) This function is done by memory. floppy disk, or CD ROM. and perform calculations which support operations that the user is doing. working parts inside and provide power to them. plug into a card slot on the motherboard. more commonly than it is used to store information from the computer. DVD may be removed from the computer. rigit case to give it durability. a stream which is like sending one bit at a time. This file has been shared by a user of PDF Archive. Document ID: 00031685.